The World Health Organization (WHO) has declared obesity a global epidemic. Its prevalence has more than doubled since 1980, causing a myriad of health problems for children and adults. 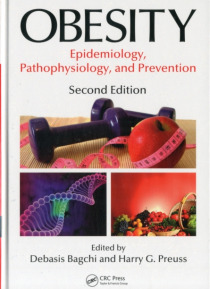 Obesity: Epidemiology, Pathophysiology, and Prevention, Second Edition explores the molecular mechanisms and pathophysiology leading to obesity and metabolic disorders. It examines the safety of obesity drugs and d… rug development strategies as well as the role of physical activity, nutrition, and nutraceutical supplements in obesity treatment and prevention.With contributions from a cadre of internationally known experts, the book covers a spectrum of essential topics related to this widespread phenomenon, including:The relationship between obesity and type 2 diabetesThe addiction mechanism related to refined foods as a significant factor in obesityThe correlation between obesity and environmental estrogens, endocrine disruption, cigarette smoking, and inflammatory responseThe role of drug and chemical toxicities and genomic imprinting disorders in obesityThe safety and regulation of prescription and over-the-counter weight loss drugsVarious diets, the glycemic index, and the role of exercise in treating or preventing obesityControversy over effective vs. banned weight loss supplementsChildhood obesity and its preventionBariatric surgery for weight management and reversal of metabolic disordersAs the public has become more aware of the deadly adverse effects of obesity, numerous products and programs have targeted the overweight and obese population, many with dangerous side effects. It is essential that we develop strategic, therapeutic intervention supported by credible data. This volume is an ideal reference point for researchers looking for new avenues of inquiry and practicing medical professionals, clinical nutritionists, and dietitians seeking guidance for their patients.